Yes, that says suet – the thing you feed to the birds. Luckily, Esther is very understanding for this months challenge – and gave us free reign to use what ever recipe we want – and if we can’t find suet – you can use a recipe that calls for butter. I wanted to make a somewhat traditional version of a British pudding, and I’ve always wanted to try Sticky Toffee pudding – after I saw the Food Network show a few years ago –that turned it into a Haagen Dazs flavor. There were a few things that made this challenging for me – on top of the fact that I never steamed a pudding before. Most of the recipes I found used a lot of ingredients that are traditionally British. Luckily, my grocery store has a small area with British foods. That is where I found caster sugar and crème fraiche. I was unable to find muscavado sugar – and I just substituted brown sugar. Also, the recipe I found – had all of the ingredients measured in grams. After I spent awhile trying to convert the grams to cups – I realized that my food scale has a kg option. So much simpler to just weigh out all of my ingredients! I’ve always wished that the U.S. would switch to the metric system – and this recipe just reiterated that for me! For the steaming part – I used my large stockpot – with my vegetable steamer at the bottom. I cooked my pudding in a 1.4 L pyrex bowl. And it worked perfectly! Be sure to check out the other Daring Baker’s puddings – there is sure to be a huge variety of flavors and techniques on this challenge! Thanks Esther for this month's challenge! The recipe I chose was Apple steamed pudding with a sticky toffee sauce – it was absolutely delicious – and I’m so glad I chose it. 1. Melt 25g butter in a large frying pan, add the apple chunks and cook until just tender and starting to turn golden. Add 1 tbsp sugar and continue to cook for a couple of minutes until the apples start to caramelize. Cool and add the walnuts. 2. To make the toffee sauce, combine all of the ingredients into a saucepan and cook until the butter and crème fraîché have melted. Bring to the boil and simmer for 2 minutes. 3. Add the apple and walnut mixture into a buttered 1.5 liter pudding basin. Pour a third of the toffee sauce over the apple mixture, set aside. 4. Beat together the remaining butter and caster sugar until pale and creamy. 5. Gradually add the beaten eggs one at a time, mixing well between each addition. Fold in the flour with a pinch of salt. 6. Carefully spoon the mixture on top of the apples and spread level. Cover with a pleated sheet of baking parchment and foil, tie securely with string and trim off any excess paper and foil. Put the bowl in a large saucepan and pour boiling water around the bowl so that it comes halfway up the sides. 7. Cover with a lid and steam for 1 1/2 to 2 hours on low heat, adding more water to the pan halfway though if needed. 8. Rest the pudding for 2 minutes before turning out onto a dish and serving with the remaining warm toffee sauce. 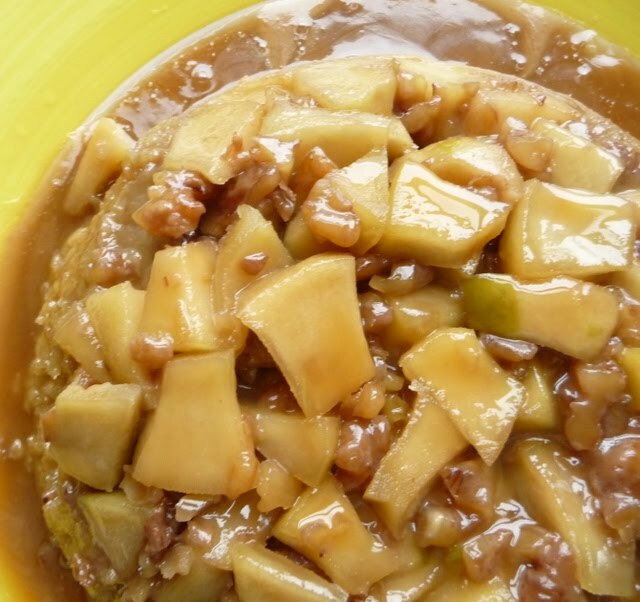 I really love the look of those apples and walnuts in toffee sauce! it looks and sounds delicious. great work. 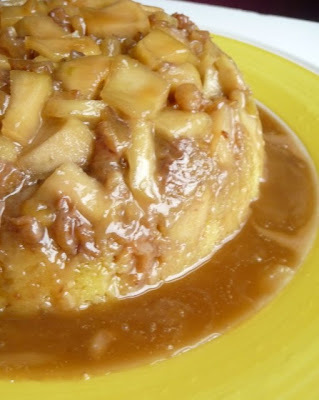 That looks SO delicious - like a caramel apple pudding cake! Great job on the challenge. I was tempted to try that recipe, as well. Ended up making a Sticky Toffee steamed pudding (which was yummy also!). I'm going to try yours here next though! Great job on the challenge! This is my first DB challenge and I have loved looking at all the different variations. Yours looks really delicious. Love sticky toffee pudding too! Wow, that looks delicious! 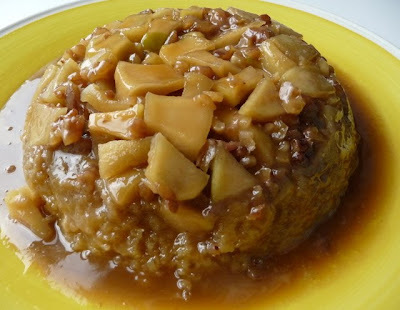 I love the chunks of apples and the sticky toffee sauce. Great job on the challenge! Man, does that look good. With a scoop of vanilla ice cream...wow! Yummy...I would like to try this too. Do you have any left Christine? Nice job on the challenge. The apples looks so good! WOW your pudding looks delicious and so tasty. It is so shiny and gleams moistness. Bravo and superb result. Cheers from Audax in Sydney Australia.